Some see it as a rite of passage. Others see it as a whole lot of work for not much pay. Regardless of the position you take, the job of a paperboy or girl is a big first step into the adult world of responsibility. You have to wake-up early, collect the papers, organize them, roll them, and then stuff them in your bag. Then it’s time to hit the streets riding your BMX as Van Halen screams from your headphones attached to your Sony Walkman. But the adventure is just beginning. You’ll have to get the paper to the right houses, avoid various obstacles (read: people), and do it fast because time is money! Paper Route, a self-published game by designer Chevee Dodd (of Scallywags fame), is comprised of 10 Customer cards, 12 Obstacle cards, 108 Controller cards (in two different colors, 54 cards per player), and 6 Life tokens (3 per player). The artwork on the cards is purposely done in a retro 80’s style and has a distinct 8-bit flair (provided by the Pixel Lincoln artist, Martin Cobb). The cards are of excellent quality and durable, and the Life tokens are nothing more than just thick plastic discs. Not included in the game, but necessary to play, is some sort medium to record the game scores. 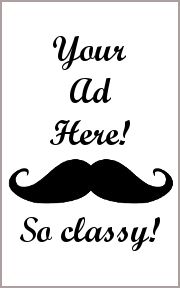 A pen or pencil and paper, Poker chips, or whatever is handy and useful would be appropriate. Note that this game is available for purchase, but you can also download it for free and print yourself out a copy! To set up the game, first separate the Customer cards (houses that will get papers) and Obstacle cards (things that will get hit by papers) into two different decks, shuffling both decks thoroughly. Both of these decks are then placed, face-down, to one side of the playing area. The players of the game will be sitting across from each other. Second, separate the Controller cards into a Player 1 deck and a Player 2 deck. The player number is listed on the front of the cards making it easy to separate. Give both decks a through shuffle. Each player will then place their Controller decks, face-down, in front of them. During the game, the player is free to pick up the deck in one hand while playing. Regardless of how the deck is held (or not), the player should never be able to see the cards in the deck or what card they are going to draw next. Third, give each player 3 Life tokens. These are placed in front of the players. That’s it! Time to delivery the papers! The game is played in rounds, but both players play the game simultaneously each round, racing each other for points and control. Unless otherwise stated, all the following actions are done at the same time by both players during a round of play. One player draws five cards from the Customer deck and places them down in the middle of the playing area between both players. The cards should be placed in a line, stretching from the players’ left to their right. One player draws five Obstacle cards and attaches them to each of the Customer cards. There will be one Obstacle per Customer card once completed. The orientation of the Obstacle cards is such that it looks like it is an extension of the Customer card. A black border has been provided to help assist in the alignment. Once completed, the table will have 5 rectangles, where each rectangle is comprised of a combination of 1 Customer card and 1 Obstacle card. Play the Card: The player places the card directly under a Customer/Obstacle card combo. Discard: The player places the card, face-up, in their discard pile. The discard pile can be anywhere the player likes, but it should be far enough away from the Customer/Obstacle cards so as to not accidentally be confused with played cards. Step 3 continues until the round is over. During the game, the players will be assigning Controller cards to the Customer/Obstacle card combos on the table. On each of the Controller cards is a button letter (A or B), a direction facing (Up, Down, Left, or Right), or a Paper. These symbols on the Controller cards represent the actions you would take if you were playing this game in an arcade that smelled of cheap pizza and Hai Karate. The goal of the players is to assign a series of Controller cards that match the Customer/Obstacle card combo’s symbols. For example, consider the following Customer and Obstacle card combo that was dealt to the table. 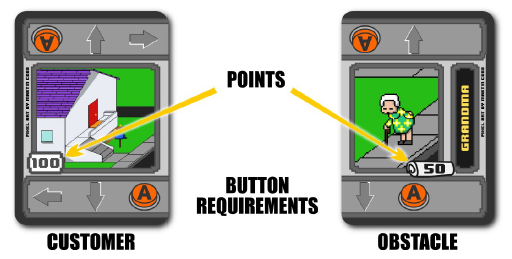 Regardless of which direction the player is looking, the Customer/Obstacle card combo needs 1 Left arrow, 2 Down arrows, and 2 A buttons. A player needs to play those Controller cards, in any order, to claim the house and score points at the end of the round. But let’s look a bit further. The “Grandma” obstacle has a Paper icon on it (worth 50 points). If the player had the Paper card, they could add it to the cards they are playing to the table. While the Paper is not necessary to claim the house, if the player has the Paper Controller card included with the cards played to the table, they’ll get a bonus of 50 points (for hitting the Grandma…oh, don’t get upset…she had it coming). Or, if the player is feeling a bit more sinister, they can vandalize the entire house. This is done by playing a Paper Controller card directly on top of the Customer/Obstacle card combo instead of below it with the other Controller cards. Customer/Obstacle cards that have been vandalized do not count for points for either player, but a house can only be vandalized if it has not yet been claimed. Which brings us to how you claim a house on your route. This is done by the player simply pulling the cards (the Customer/Obstacle combo and all cards played below it) closer to their side of the table. This signifies that the player “thinks” they have the right cards under it and they are going to take it for scoring. No additional cards can be played on a claimed Customer/Obstacle combo by either player for the duration of the round. The rounds ends as soon as all five of the Customer/Obstacle card combos have been claimed or both players run out of cards. It is now time to score points and possibly lose life! 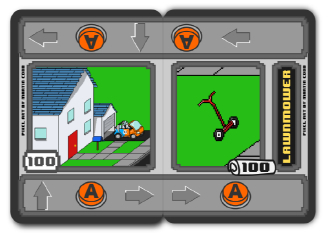 Players will score the houses they claimed, one at a time, making sure their opponent can see the Controller cards that were placed under it. Vandalized Customer/Obstacle combos are not scored by anyone. If the player correctly placed no more and no less than the correct amount of Controller cards under the Customer/Obstacle combo, the player will score the points noted on the Customer card. The player only scores the points on the Obstacle card if they played a Paper Controller card, but the Paper Controller card is not necessary to score the Customer card. Extra Papers do not score extra points. If the player finds that they had one too many, came up short during the card count, or simply played the wrong cards, the house is not scored and the player will lose 1 Life token. The Life token is simply placed to the side and is out for the duration of the game. Extra or no Paper Controller cards will not cause a player to lose a Life token or score extra points. The following would be worth 100 points or 200 with a Paper Controller card – but only if played correctly! Scored points should be written down and tallied for each round. Any Paper Controller cards that were played to vandalize a house are now removed for the duration of the game. All other Controller cards are now collected by their owners and the Controller decks are reshuffled. 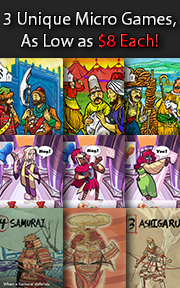 The Customer and Obstacles cards are also collected and reshuffled into their respective decks. A new round now begins as described above unless the game is now over. The game ends after 4 rounds of play or a player looses all 3 of their lives. After the fourth round is completed, and both players still have Life tokens left, all the points are tallied. The player with the most points is the King/Queen of the Paper Route! That new BMX bike with a chrome finish is as good as theirs! If the game ends because one of the players have lost all 3 of their Life tokens, the other player wins by default. Of course, if both players end up losing all their Life tokens during the same round, then no one wins the game. To learn more about Paper Route and read the full rules (as well as download the print-n-play game), visit the game’s web page hosted on the designer’s web site or visit the Game Crafter web page where you can buy the game pre-printed and ready to play! 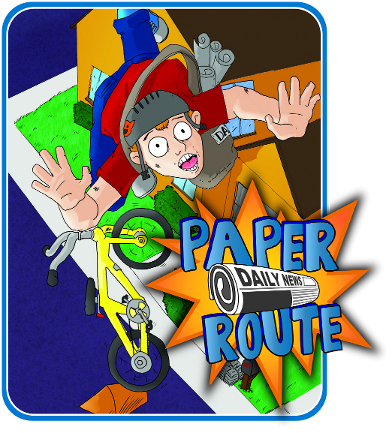 Game designer, Chevee Dodd, created Paper Route using a game system of his own design. This game system, titled Cardboard Arcade, is available to anyone to download and use to create their own games. The entire game system comes with a standard Controller deck which is comprised of 10 Up, 10 Down, 10 Left, 10 Right, 5 “A”, and 5 “B” cards (50 in total). There are also 4 “optional” cards that can be included that are meant to cover anything that is needed. The “Start” and “Pause” buttons, for example, or anything else the game designer requires. The Controller deck is the base of the entire game system and is meant to be used to represent that arcade game controls that many of us grew up with. 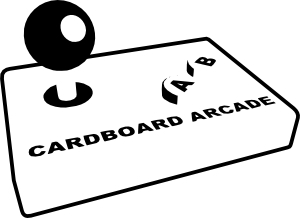 Full details about Cardboard Arcade and all the files you need to use to create your own games, as well as a forum to talk to others, is available to you at the game system’s official web site. First off, a bit of a confession and some disclosure. The game we are reviewing was created, in part, because I suggested to the game designer he make it. That was really the only input I gave on the game…well, that and about 5 or 6 direct messages about how much I loved Paperboy as a kid. About a month later, he told me he had created a card game based off the video game, and wanted to know if I would be interested in giving it a look. I about fell over myself in a mad rush to type “YES!” on the keyboard. When the game arrived, I eagerly opened it and started reading the rules. The more I read, the more I smiled. The video game, on which this card game is based, is an exercise in reflexes and timing. The card game was, too. The rules also made the game play very simple (flip a card, play it, rinse, repeat), but between the lines I could already see how frantic the game would become as the two players raced each other for the same points. Teaching the game is a very simple exercise. The only complicated portion of the game is the set up (which isn’t complicated whatsoever). All I had to do was show a random match between a Customer card and an Obsticale card and then show how the Controller cards matched it. I also spent a few minutes talking about the strategies the players could use with the Paper Controller card. The Paper had the ability to make points for the owner, or reduce the opponent’s points, but at cost of the card. After that, I would ask if there were any questions. Always hearing none, we started the game. And so, as I set up the game for my two oldest little geeks to play, I asked them both what they thought of Paper Route so far. Time to hit the street and see if this game is newsworthy or not. Paper Route is exceedingly simple and yet insanely complicated to play. The game is fast (sometimes too fast) and keeps both players on their tippy toes from the very start. The cards were literally “slammed” down on the table when the Child Geeks played it, as they tried to place their cards as fast as they could. But speed isn’t the only aspect of the game that makes it complicated. Memorization is a must. Players must attempt to remember what cards have been played on Customer/Obstacle combo stacks, since they can never pause the game and give the cards a look. This both frustrated and entertained the Child Geeks, as they attempted to out think and out pace their opponent. Parent Geeks were equally challenged, as the difficulty in this game increased base on their opponent’s ability. When Parent Geeks played against their Child Geeks, they played the game quickly but didn’t look mentally exhausted. I know for a fact they were concentrating (as several Parent Geek’s told me to “shush” when I asked them what they thought of the game as they played it), but their was no feverish rush. The Parent Geeks kept pace with the Child Geeks and had a great time. 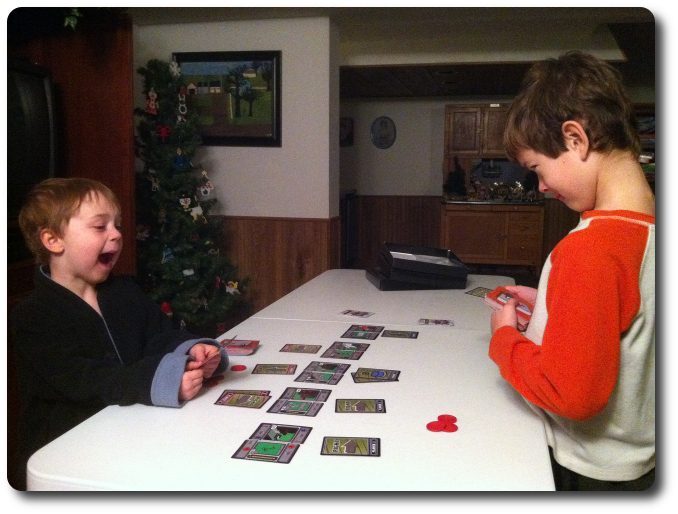 When they played against their peer group, the game immediately became more intense, as did the emotions at the table. The game has a unique ability to make Parent Geeks swear under their breath..a lot. When the games were over and the participants sat back, exhausted, they were most pleased with the experience. Gamer Geeks were fairly uncertain what to make of this game when I first showed it to them. They immediately recognized it as a speed and dexterity game, but when they saw the game play out, they also came to realize that much of the game was being played in the individual’s mind and memory. While having quick reflexes helped the players, having a sharp memory was a must. Any player who was able to just deal with the cards they drew and place them, remembering what they previously placed and where, would always have an advantage. When the dust settled, the Gamer Geeks were eager for another round. Gamer Geeks, this is a surprisingly challenging game of speed and memory, as the players attempt to create correct card sets that need not be in the order listed on the cards. This makes every card you draw a possible play and keeps the players constantly evaluating their side of the table as the cards are revealed. While the player can control the speed of their own game, playing against an opponent who is going as quickly as possible makes the other player’s game speed up, too. As both players attempt to out play each other, the game goes faster and faster, with the cards becoming harder and harder to play. The faster you go, the less time you have to think, and this is most certainly a thinking game. Paper Route has been enthusiastically approved by your peer group and would make for an excellent starting game for the evening while waiting for others to arrive or whenever a quick game of mental and physical reflexes is needed. Parent Geeks, your peer group very much enjoyed this game and found it to be a lot of fun with your peer group and with your family, but only two at a time. One Parent Geek suggested that having more than one copy would be nice so you could have two games going at once. And why not? While you can buy the game pre-printed and ready to play, you are welcome to download and print the game off yourself, too. This really pleased the Parent Geeks, and they promptly started to pass the game files around to other family and fiends. Child Geeks, this is a game that will most certainly challenge you, but it will also highly entertain you. Your peer group had a blast playing it and were thrilled by how the game sweeps you up and carries you quickly from start to finish. Note that the game’s learning curve is easy, but you’ll have to play this game a few times to get your own rhythm down. You must play fast and smart or you will never come close to winning a game. A quick hand, eye, and mind will ensure you not only have fun, but challenge your opponent! I think the game designer did an outstanding job of capturing the video game without actually duplicated the video game’s game play. In many ways, I actually find the card game to be a vast improvement on the video game’s code. No glitches (except those you have in your brain), no cheats (you will be penalized for bad cards), and there is a real feeling of risk vs. reward as you attempt to push your own limits to put distance between you and your opponent. I could not be more pleased with Paper Route and eagerly suggest it to all I play games with. It really is super fun. Plus, it’s free! No rolls of quarters necessary. If you are looking for a fast paced game of dexterity and memory, where pattern matching is freeform, do take a look at Paper Route. You can print it and roll your own or buy the game fully made and ready to play. Whichever path you choose, you’ll be most pleased with the results it delivers at the end of your journey. Tagged Card Games, Father Geek Approved, Gamer Geek Approved, Parent Geek Approved, Print and Play Games, Real-Time Games, Video Game Themed Games. Bookmark the permalink.